The Nation’s Eyes are on Atlanta! With Super Bowl weekend approaching, legislative leadership on both sides of the aisle want to ensure positive press — so rumor has it that the filing of controversial bills has been put off until after Super Bowl weekend. Note: Keep this in mind next week and and be ready to play defense! Also, the Georgia General Assembly adjourned early this week because legislators can’t afford Super Bowl hotel rates on their $173 per-diem. We were only in session for two days this week since Tuesday was a (non) snow day. Even though we have been working for three weeks, we have only used seven of our 40 legislative days. For a change, women were the beneficiaries of a positive spotlight! 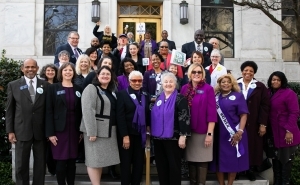 The Georgia Senate made headlines when we introduced a bill to make Georgia the 38th state to ratify the ERA! I was proud to sign the Senate bill this week and stand with my colleagues as we made our press announcement. Many people are surprised to learn that the ERA is still not a part of our Constitution. While Congress passed the ERA in 1972, 38 states are required to ratify a Constitutional amendment. Should Georgia become that 38th state, there will still be some work needed to lift the 1982 deadline that was imposed by Congress. There is a bill in Congress to eliminate the deadline, or the deadline could be challenged in court. The GA Senate now has enough signatures to pass the ratification bill if it comes to the floor, so it is now up to our House leaders to determine if Georgia will make history. Having nine cities and three counties in my Senate District can be both blessing and a challenge. On the one hand, it gives me a “birds eye view” of what’s happening in all of those cities and counties and an opportunity to identify common themes and challenges and share ideas and best practices among local leaders. But it also means I have many meetings to attend! 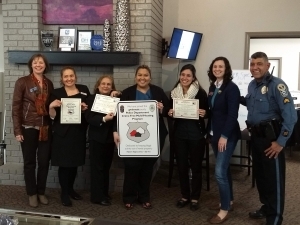 Gwinnett County Police said it was a first — to have a both a State Representative and a State Senator attend a Crime-Free Multi-Housing community meeting. Thanks to Charles Levinson and the Barrington Hills Apartment Community, Peachtree Corners, for inviting both Rep. Beth Moore and myself! — Visiting with City Officials: During the session, lots of local and state advocacy groups come to visit the Capitol and many times offer a casual breakfast or lunch so that legislators can stop by and say hello in between chamber sessions and committee meetings. This week, I visited with the DeKalb members of the Georgia Municipal Association during lunch, which allowed me to reconnect with mayors, city council members, and city managers that I had previously met, and talk with others that I hadn’t yet met. The box lunch they provided ultimately fed me and my staff member Amy Swygert, and I still took home leftovers and fed my daughter! Thank you, DeKalb Municipal Association! — Taking Care of County Business: Many of Georgia’s larger, urban counties organize into official House and Senate delegations and meet regularly to discuss and pass local legislation. 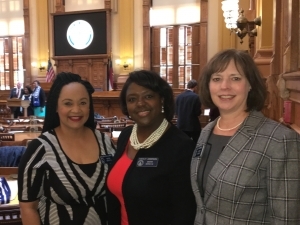 This week, I met with both the DeKalb and Gwinnett caucuses and was honored to be elected Vice Chair of the DeKalb County Senate Caucus. — Being “One of the Boys”: Making progress for women sometimes requires becoming one of the boys because it can be a great way to build bonds with colleagues. This week, I accepted an invitation to join the “Cigar Caucus,” even though I don’t smoke. Fortunately, newly elected Rep. Matthew Wilson attended too, so I was in good company! I remember cigars being a big part of the General Assembly culture from when I served before. House Speaker Tom Murphy, the longest serving House Speaker in United States history, with whom I had the honor to serve, often had an unlit cigar in his mouth (it was not legal to actually smoke in the chamber). At the Cigar Caucus I shared a picture from 1999 of all the female Representatives sharing an unlit cigar with the Speaker for his birthday. Senator Tonya Anderson, My office suite mate, and I congratulate newly-elected Democratic Party of Georgia Chair Senator Nikema Williams. Each week, I will have opportunities to sign several bills on issues big and small. 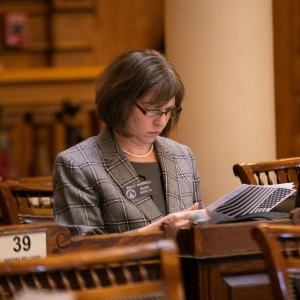 I can’t mention them all in my weekly update, but you can always find legislation that I’ve signed here: “Member Legislation: Sally Harrell“. — Medicaid Expansion: Healthcare is still the most critical issue facing Georgians. Ben Watson, Chair of the Senate Health and Human Services Committee, wrote an article proposing a Medicaid “waiver” program similar to Indiana’s program. I was born and raised in Indiana, so I took a look at what they are up to. What I found were some unique program components that set up access obstacles that have resulted in decreased utilization. That’s why I went ahead and signed SB 36, a Democratic bill to fully expand Medicaid, which is the only way to put an insurance card in the pocket of 500,000 Georgians and keep our rural hospitals open. — Redistricting Reform: I signed SR 52, a Constitutional amendment to reform the way we draw Congressional and legislative district lines in Georgia by creating a nonpartisan, independent redistricting commission like ones already in place in about a dozen other states. These Commissions remove the impossible ethical dilemma lawmakers face in drawing their own district lines. Preserving voters’ rights to choose their own elected officials instead of the other way around is critical to preserving democracy. In November, voters in Michigan, Colorado and Missouri overwhelmingly passed ballot initiatives to create independent redistricting commissions. States with independent redistricting commissions have been shown to produce much more competitive elections. — Moms Matter: During my time in the House, I became a new mom just prior to my second session, and ended up needing to breastfeed my son while on the job. While I’m glad this led to a law to protect women who breastfeed in public, I would have very much welcomed a lactation room that many workplaces now provide. Unfortunately, the Capitol still does not have such a room, so I was happy to co-sign SB 4, sponsored by Sen. Jen Jordan, to finally create an official lactation room at the Capitol for nursing mothers. I remember fighting for two years just to have a diaper changing table installed in the Capitol! Last week, I mentioned the Senate Page Program which is a wonderful way to get your kids involved in state government. You can fill out the application on the Senate Page Program website and then send it to my assistant, Anna Boggs. Her email address is Anna.Boggs@senate.ga.gov. Please note that her this is her correct email address. We had a slight typo in our last update. Thank you to everyone that volunteered to help us with Local News and Events and Photography! We will be in touch shortly with more specifics.